The information below is taken from Parish Registers, Grewelthorpe school and census records, and memorial inscriptions M.I. from Grewelthorpe & Kirkby Malzeard churchyards. Thanks to Suzanne Overton for information about her great great grandfather Miles Baul 1807 – 1890. Suzanne would like to hear from anyone with information about this branch of the family. [Nov 2018]. Thanks to Dorothy Manning for information about the family tree of Miles Baul & Jane Wray. [May 2018]. Thanks to Susan Artal for additional information. Thanks to Wendy Dawe in Australia for information about Joseph & Sarah Jane Warrener. and their family. Chris Orton sent following message Oct 2012. I came across this site because I was researching my family and I was trying to trace my great grandmother Annie Baul. I was frustrated because I could not find her on FreeBMD, but seeing her listed on your site helped me to search again and I found her listed as “Baul, Female” at birth!.As you say, Annie married William Lupton, one of their sons Herbert Lupton lived in Harrogate and Pateley Bridge, one of his daughters was my mother Betty Lupton. 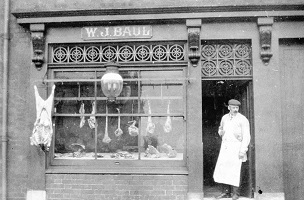 Thanks to Shirley Dunwell for photos of John Baul & Mary Jane Thackray and their family and WJ Baul and his shop. Can anyone add to the story of this family, and do you know where the shop was. Please let us know. [Dec 2013]. If you find this page helpful or have anything to add please contact me. Researched by B.Bradley. Last updated Jan 2019. ALBERT BAUL. Born 6 April 1892. Married to Eva L. [born 1898]. A road labourer living Grantley in 1939. ALBERT BAUL. Born 7.12.1892. Bap. 5.2.1893. Son of Jane Annie servant at Thorpe House. Grandson of William Baul. Started Grewelthorpe school 27.9.1897. EVA LILIAN BARKER. In Winksley Church on 11.9.1937. [See Barker page]. ALICE BAUL. Born 1.10.1866. Bap. 17.3.1867.Dau of John & Mary Jane Thackray. Had been at Dame school before starting at Grewelthorpe school 12.3.1877. Married in 1888 to John Bolton. at Ormskirk. Lancs. Reg.Office. Had 4 children Gertrude, Gladys, Edna & Jack. In 1911 she was a widow running a drapers shop in Wigan. Living with 2 unmarried sisters Martha & Elizabeth. ANN BAUL. [Nee Porter]. Born C.1811 Thirsk. Dau of Robert Porter. 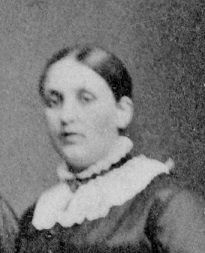 Widow in 1849 when she married John Calvert. Blacksmith of Galphay son of James Calvert. Marriage on 13.12.1849 at Kirkby Malzeard. They had dau Ann Calvert. born 1851. Ann had 5 children to her 1st marriage to James Baul. He died in 1845. Their children were Joseph. Mary. James , William & Robert. ANN BAUL. Born 1809. Died 1886. Dau of William & Sarah Close. married John Grainge. [b.1809]. in 1834 at Kirkby Malzeard. Witness at marriage of Jane Spence & John Cundall. in 1833. ANNIE BAUL. Bap. 1.1.1858 Kirkby Malzeard. Dau of John & Mary Jane Thackray. of Warren Lane. In 1883 she married William Lupton of Bilton, Harrogate. Had a son Herbert. ANN BAUL. Bap. 11.12.1862 Kirkby Malzeard. Dau of John & Mary Jane Thackray. of Warren Lane. Twin Sister Elizabeth Bap.at same time. Ann married George Hammond of Wigan. Ann Baul twin sister to Elizabeth. ANNIE BAUL. Born 1868 Yeadon. Dau of James & Mary Ann Poulter. Living Azerley 1881. Died 1944. Married William Richmond see Richmond page. ANNIE ELIZABETH BAUL. Born C. 1900 Ripon. Dau of James [roadman] & Annie Eliza. of Galphay. ARTHUR BAUL. Born 24.7.1934. Son of John of Hutts Cottage. Started Grewelthorpe school 17.4.1939. Left for Grammar school 1945. BERTHA CLOSE BAUL. Born 21.6.1883.Bap. 29.7.1883. Dau of William & Martha Close. of Thorpe Moor. Started Grewelthorpe school 3.9.1888.Lived Naegill End in 1904. Married Henry Malthouse. a widower age 29 from Healey in 1906. In 1911 they had 3 children. Henry had a son previously. Living with her widowed Father William in Grewelthorpe. BESSIE A.BAUL. Born 16 Nov 1920. Dau of William & Jane of Masham. A Dairymaid in 1939. Married ? Brooks. CHARLES BAUL. Born C. 1904 Galphay. Son of Joseph & Sarah Jane Warrener. of Winksley Banks, Galphay. Emigrated to Broken Hills. NSW Australia and had a son Bruce. EDMUND BAUL. Born 20.6.1869. Son of Edmund of Westfield. Azerley. Came from Mickley school to Grewelthorpe 28.1.1878. Left 1878. EDMUND BAUL. Born C.1899 Galphay. Son of Joseph & Elizabeth Hammond. of Gate Bridge, Azerley  & . On Nov 5th 1925. Edmund Baul of Galphay with John Dent of Winksley and Christopher Pickersgill of Laverton set fire to a car belonging to Oswald Garfield Cook of Galphay. He pleaded not guilty and was fined 10s and £2 costs. Pickersgill was guilty. [Ref. Yorks Post 1954]. EDWARD BAUL. lived Thorpe House, Grantley. Married Ivy Waite. of Crosshills Grewelthorpe. 8th May 1929. EDWIN BAUL. Born C.1870 Winksley. Son of George & Mary. Ag Lab Aldfield in 1891. Possibly died 1902 in Ripon. [see letter at end from Luke Baul]. EDWIN BAUL. Born 1873. Died 1950. Son of Miles & Mary Bowen. Married Sarah Tebb. farmed Watergate Bishop Thornton in 1901 and 1911, Barsneb Markington in 1920s and Middle Rigg Sawley in 1930s. Buried Sawley churchyard. ELIZABETH BAUL. Born C.1807 Grewelthorpe. Wife of William. ELIZABETH BAUL [Nee Bolton Metcalfe.] Born C. 1843 North Stainley. Died 19.2.1931. at Camp Farm Grewelthorpe. The home of her dau. Minnie Clarkson [nee Baul]. M.I. Dau. of George Metcalfe. Married Robert Baul [Shoemaker.] on 11.6.1870 at Kirkby Malzeard church. Living Azerley 1881. ELIZABETH BAUL. Bap. 8.11.1846 Kirkby Malzeard.Died 10.4.1922 Aldfield. Dau of Miles & Sarah Norris. of Craven Gill. Married John Metcalfe. ELIZABETH BAUL. Born 11.12.1862. Dau of John & Mary Jane Thackray. Had been at Dame school. Started at Grewelthorpe school 12.3.1877. Left 1877. Baptised on same day as twin sister Ann. Elizabeth remained unmarried. Died 1937 in Lancashire. Elizabeth Baul. Twin of Ann. ELLA BAUL. Born C.1891. Died 3.10.1978. M.I. Wife of John of Straw House. ELLEN BAUL. Born 1840. Died 14 .7.1899. Dau of Miles & Sarah Norris. ELLEN BAUL. Born C.1887 ALDFIELD. Dau fo John & Sarah of Horsley Gates, Aldfield. EVA BAUL. Born b.22.7.1902. Dau of Joseph & Sarah Jane Warrener. of Winksley Banks, Galphay. Emigrated to Australia. in 1924. Married ? Marshall. Adopted a son , Len. Died in Sale, Victoria, Australia. EVA LILIAN BAUL [nee Barker.] Wife of Albert Baul of Grantley. Grand daughter of John Barker of Grantley. Married 1937. FRED BAUL. Born C. 1904 Galphay. Son of James & Annie Eliza. of Galphay. FREDA BAUL. Born C1906 Galphay. Dau of Joseph & Elizabeth Hammond. GEORGE BAUL. Born C.1832 Azerley. Died 1897. Son of Miles & Sarah Norris. Farmed at Clapthorn Farm, Aldfield in 1891. Married to Mary born in Burrill 1833. GEORGE BAUL. Born 1868. Died 1959. Buried Hampsthwaite. Son of Miles & Mary Bowen. Married Mary Jane Myers. Farmed at Clint. GLADYS BAUL. Born 24.1.1932/33 Australia. Dau of Harold & Minnie Baul. HANNAH ELIZABETH. Born 22.10.1866 Bp. 23.12.1866. Kirkby Malzeard. Dau of William & Martha Close.of Grovedale. Called Elizabeth at school. Started at Grewelthorpe school 13.11.1876 after being taught privately. Left school 1878. Died unmarried in 1906. HARDY BAUL. Bap.25.10.1872 Mickley. Son of Edmund & Elizabeth. HAROLD BAUL. Nephew of Albert Baul of Grantley. Best man at wedding of Albert & Eva Lilian Barker in 1937. Possibly this is the Harold Baul Born C. 1902. Son of James & Annie Eliza of Galphay. It is possible this is the Harold who married Minnie Baul. in 1929 in Australia. He died in April 1982 in Australia. Comment sent by Sam in Oct 2018. Where you reference HAROLD BAUL Nephew of Albert Baul of Grantley. Best man at wedding of Albert & Eva Lilian Barker in 1937. I think this is the Harold Baul. born in Bishop Monkton September 1911. Son of William and Mabel Baul. Strangely, this Harold Baul also married a Minnie (new Waddington) in 1943, and they lived in Grantley from 1951 until their death. They had 3 children David, Georgina (Gina) and Carolyn. I am Harold’s Grandson. Hopefully this helps. Thanks, Sam. HERBERT BAUL. Born C. 1890 Galphay. Son of Joseph & Elizabeth Hammond.. Living Gate Bridge, Azerley in 1901. HERBERT C. BAUL. Born 3 Sept. 1911. Son of William & Minnie of Woodhouse Farm Grantley. HILDA BAUL. Born C.1897 Galphay. Died 1967. Dau of Joseph & Elizabeth Hammond. Married James Pickles. Living Gate Bridge Azerley in 1901. JAMES BAUL. Born C.1774. Died 1791. Son of Miles & Jane Wray. JAMES BAUL. Born 1804. Buried 5.2.1845.Kirkby Malzeard. Son of William & Sarah Close. Married Ann Porter. of Thirsk. in 1837. James was a Blacksmith. James & Ann are buried Grewelthorpe churchyard. JAMES BAUL. Born 1842. Died 1907. Son of James & Ann Porter. Married Mary Ann Poulter. [1840-1915] of Sutton Grange. JAMES BAUL. Bap. 23.9.1855 Dallowgill. Son of Miles & Sarah. JAMES BAUL. Born 13 July 1871. Married to Louisa [born 1883]. Had smallholding in Galphay in 1939. JAMES BAUL. Born C. 1872 Galphay. Died April 1954. Son of Robert [Shoemaker] & Elizabeth Metcalfe. In 1897 married Annie Eliza [b.1868] Ripon. In 1911 he was a roadman living Galphay. with wife & 4 children. JANE BAUL. Born 1772 Galphay. Died Oct 1773. Dau of Miles & Jane Wray. JANE BAUL. Born 1800. Died 1860. Dau of William & Sarah Close. Jane remained unmarried. Had son Edmund with gentleman David Wright. Edmund was Ill. [Ref. D.Manning]. JANE BAUL. Born 1842. Died 1930. Dau of Miles & Sarah Norris. JANE BAUL. Bap. 2.10.1853 Kirkby Malzeard. Dau of John & Margaret of Galphay. JANE BAUL. Born 1871.Dau of William. Came from Galphay to Grewelthorpe school, started 25.3.1878. Left in 1878. JANE ANNIE BAUL. Born 8.7.1873. Died 26.3.1900 Azerley. Dau of William & Martha Close. of Bramley Grange. Started Grewelthorpe school 28.6.1880. Left 1886. Mother of Albert Baul. Married John William Cartman. on 28.12.1895 at Grewelthorpe. JOHN BAUL. Born C. 1814 Kirkby Malzeard. Married Margaret born Pateley Bridge in 1816. Lived Gate Bridge, Azerley 1881. JOHN BAUL. Born 1816. Died 1889. Son of William & Sarah Close. Married Sarah. Had a son Joseph. JOHN BAUL. Bap.11.3.1832 Kirkby Malzeard. Died 1883. Son of William & Elizabeth Spence. Married Mary Jane Thackray. John Baul. & Mary Jane Thackray. 25.8.1852. at the Temple Chapel. Living Grewelthorpe in 1871. Moved to Newburgh Lancs C1881. JOHN BAUL. Born 1839 Died 2.2.1840. Son of Miles & Sarah Norris. JOHN BAUL. Bap. 22.9.1850 Kirkby Malzeard. Died February 1940 in Ripon. Son of John. Lived 9 Ash Grove Ripon. Methodist. Farmer. Funeral at Winksley. JOHN BAUL. Bap. 5.10.1851 Dallowgill. Son of Miles & Sarah Norris. JOHN BAUL. Born C. 1853 Farmer at Horsley Gates, Aldfield [1891- 1911]. In 1884 he Married Sarah Burton. born Winksley in 1853. In 1911 they had 5 children. JOHN BAUL. Born C.1891. Died 1.6.1964. M.I. Husband of Ella. Lived Straw House. possible son of John & Sarah of Horsley Gates.Aldfield. JOHN WILLIAM BAUL. Born 1.4.1900. Bap. 12.8.1900. Son of Bertha of Naegill End. Grandson of William. Started Grewelthorpe school 3.5.1904. Served in WW1. Married Evelyn Annie [born 1900] living Hutts Cottage in 1931. A petrol lorry driver in 1939. JOSEPH BAUL. Bap 5.1.1817. Buried 25.3.1838. Son of William & Sarah Close. of Galphay. JOSEPH BAUL. Born 24.5.1838 Galphay. Died 21.2.1896. Son of James & Ann Porter. Married on 24.1.1863 Kirkby Malzeard church to Mary Close. [b. 1835] dau of Anthony Close. a Grocer. M.I. Kirkby Malzeard churchyard. Joseph a Blacksmith in Azerley 1881. JOSEPH BAUL. Bap. 30.8.1857 Kirkby Malzeard. Son of John & Margaret [or Sarah?] of Galphay. Married on 27.5.1882 at Kirkby Malzeard church to Elizabeth Hammond. [b.1863] dau of George Hammond. Joseph was a Farmer at Gate Bridge, Azerley in 1901 & 1911. JOSEPH BAUL. Born C. 1875 Aldfield. Son of George & Mary of Clapthorn Farm, Aldfield. Married on 2.10.1899 to Sarah Jane Warrener [b.1872]. Darlington. In 1911 living Winksley Banks, Galphay. JOSEPH BAUL. Born 1878. Son of Robert & Elizabeth Metcalfe. Killed in a cart accident in 1889. JOSEPH SYDNEY BAUL. Born 4 Oct. 1881 Galphay. Grand son of Joseph [The Blacksmith] & Mary Close. In 1911 working as an Estate Lab. Living with William Richmond. Unmarried in 1939 living Galphay. Drivers Mate. JOSEPH ROBERT BAUL. Born C. 1886. Died 5.6.1897. Buried Kirkby Malzeard churchyard. M.I. Son of Robert & Elizabeth of Galphay. He was killed in a cart accident. J.BAUL. married Miss Jefferys at Grewelthorpe Church in January 1930. KEITH JEFFERY BAUL. Born 1932. Died 1933. Son of J.Baul of Hutts Cottage, Grewelthorpe. KENNETH ROYCE BAUL [Roy]. Born 30.10.1930. Australia. Son of Harold & Minnie Baul. LOUISA BAUL. Born C. 1884. Died 21.4.1954. Buried Kirkby Malzeard churchyard. M.I. LUCY BAUL. Born 23.3.1876. Dau of William & Martha Close. Started Grewelthorpe school 19.6.1882. Left 1883. Married John Thomas Atkinson. [b1874] in Sept. 1896. He worked at Varnish works in Ripon. MARGARET MINNIE BAUL. Born 8.8.1935 Australia. Dau of Harold & Minnie Baul. MARIA BAUL. Born C. 1895 Dau of John & Sarah Of Horsley Gates, Aldfield. MARTHA BAUL [nee Close]. Bap. 26.11.1837. Buried 18.9.1895. Dau of Anthony the grocer & Hannah Smith. Married William Baul on 26.5.1866 at Kirkby Malzeard church. MARTHA BAUL. Bap. 23.2.1856 Kirkby Malzeard. Died 1893. Dau of John & Mary Jane Thackray. of Warren Lane. This could be Martha, known as Pattie in the family. See family photo at end of this page. MARTHA ANN BAUL. Born C. 1867. Died 12.3.1893. M.I. Kirkby Malzeard churchyard. Wife of Simon Pickersgill. Dau of Joseph [The Blacksmith] & Mary Close. of Galphay. MARTHA BAUL. Born C. 1890 Aldfield. Dau of John & Sarah of Horsley Gates, Aldfield. 1911 a Sales woman, shop assistant. MARY JANE BAUL [nee THACKRAY.] Born C.1831 Eavestone. Died 1887. Farmers wife and sister of William Thackray. of Bramley Grange. 1881 census. Dau of William & Ann Thackray. Married John Baul 28.8.1852 at Temple Chapel. Moved to Newburh Lancs 1881. MARY BAUL. Born C. 1832. Dau of John. Married as a widow on 17.3.1900 at Kirkby Malzeard to Thomas Cundall [b1835] widower,son of John. MARY ANN BAUL [Polly] Born C. 1874 Galphay. Dau of Robert [Shoemaker] & Elizabeth Metcalfe. Married John Swiers. MARY BAUL. Born C. 1833. Died 1.10.1897.Wife of Joseph of Galphay. M.I. Kirkby Malzeard churchyard. MARY BAUL. Born 1841 Azerley. Dau of James & Ann Porter. MARY BAUL. Born 19.3.1841. Died 1886. Dau of Miles & Sarah Norris. MARY BAUL [NEE ?]. Born 1842 dau of John ? She was a widow when she married widower Thomas Cundall. on 17.3.1900 at Kirkby Malzeard church. He was born 1835. son of John Cundall. Witness at marriage John Baul. MARY HANNAH BAUL. BAP. 22.11.1863 Kirkby Malzeard Dau of Joseph [The Blacksmith] & Mary Close. of Galphay. MARY BAUL. Born 15.6.1869. Kirkby Malzeard. Dau of William & Martha Close. of Grovedale.Probably called Polly at school. Started at Grewelthorpe school 15.1.1877. Left in 1882. Mary unmarried servant in Ripon in 1891. MARY ANN [POLLY]. Born 1874. Married John Swiers.. Dau of Robert & Elizabeth Metcalfe. MARY BAUL. Banns read for marriage to Arthur Atkinson. of Ripon in Grewelthorpe in Oct. 1894. MATILDA BAUL. Born Warren Lane. Bap.27.2.1854 Kirkby Malzeard. Died 1909 age 55. Dau of John Baul & Mary Jane Thackray. Married Charles Pickles. son of Charles & Esther Pickles. of Grewelthorpe. MILES BAUL. Born C.1740. Died June 1827 Galphay. Married Jane Wray. 0n 5.4.1768. Blacksmith. MILES BAUL. Born 1807. Died 14 Sept.1890. Buried Aldfield. Son of William & Sarah Close. Married Sarah Norris. had 9 children. MILES BAUL. Born 22 Aug 1839. Galphay. Died 7 July 1898. Buried Ripon Cathedral. No headstone. Son of Miles & Sarah Norris. Married Mary Bowen. Miles having started off as a carter was Farm Bailiff at Newby Hall at the time of the Nidd Ferry disaster there in 1869, it concerned the York and Ainsty Hunt, the overturning of the ferry and the drowning of 6 men including relatives of the Vyner family. He later farmed at Bland Close, Whitcliffe Lane and had 4 sons. Thanks to Suzanne Overton for this data. MILES JAMES BAUL. Born 1865. Died 1954. Buried Ripon. Son of Miles & Mary Bowen. Married Annie Hawkins. Farmed Raventofts Bishop Thornton. MILES BAUL. Born 14 Jan 1902. Dairy farmer married to Elsie [born 1903]. Living Hedge Nook Kirkby Malzeard in 1939. MILES BAUL Jnr. Born 22 Jan 1931. Son of Miles & Elsie. MINNIE BAUL. Born C. 1880 Galphay. Died 1967. Dau of Robert [Shoemaker] & Elizabeth Metcalfe. Married John William Clarkson. MINNIE BAUL. Born 11.3.1906 Galphay. Died 27.5.2000 Australia. Dau of Joseph & Sarah Jane Warrener. of Winksley Banks, Galphay. Minnie married Harold Baul. [same surname ]in 1929 in Australia. Her cousins Dorothy, George & Alice Baul all emigrated to Australia. All unmarried. RHODA BAUL. Born 30.10.1870. Dau of William & Martha Close. of Grovedale. Started school at Grewelthorpe 13.11.1876 after being taught privately. Left 1878. Married John Thomas Bolton. of Tanfield. approx 1894. ROBERT BAUL. Bap 25.6.1844.Kirkby Malzeard. Died 2.8.1919.M.I. Son of James & Ann Porter. Married on 11.6.1870 at Kirkby Malzeard church to Elizabeth Bolton Metcalfe. [b.1843] living Braithwaite Hall at marriage. Dau of George Metcalfe. ROBERT WILLIAM BAUL. Born C. 1908 Galphay. Son of James & Annie Eliza of Galphay. SARAH BAUL [Nee Close] Bap 6.12.1776. Fellbeck. Died 30.4.1856. Dau of John Close. & Margaret Dunn. Wife of William Baul of Galphay. Married 7.11.1799. SARAH JANE BAUL [nee Warriner]. Born C1872 Darlington. Died 1985. Australia. Wife of Joseph. 1911 Living Winksley Banks, Galphay. SARAH [SALLIE] BAUL. Bap. 6.7.1873. Dau of John & Mary Jane Thackwray.. Farmer at Bramley Grange. Living Wigan Lancs. 1891. Married Thomas Jones. Blacksmith in Wigan. Married in September 1900. SARAH BAUL. Born C.1885 Aldfield. Dau of John & Sarah of Horsley Gates, Aldfield. In 1911 doing dairy work on farm. SELINA BAUL. Born 1871 Yeadon. Dau of James & Mary Ann Poulter. STANLEY BAUL. Born 9 Aug. 1911. of William & Jane of Masham. A grocers shop assistant in 1939. SYDNEY BAUL. Born C.1881 Galphay. Possibly son of Joseph & Elizabeth. Stockman at Gate Bridge, Azerley in 1901. WILLIAM BAUL. Born 17.6.1776 Galphay. Bap.17.6.1776. Died 1.2.1857. Kirkby Malzeard. Son of Miles [The Blacksmith] & Jane Wray. Married Sarah Close of Grewelthorpe. 11.7.1799. Living Galphay High Barn C1841. retired in Azerley 1851. William was the only child of Miles & Jane to survive to adulthood. WILLIAM BAUL. In 1800 He was the landlord of the Cross Keys Inn. North Stainley. WILLIAM BAUL. Born 1802 Poss. Galphay.Bap.4.4.1802 Kirkby Malzeard. Buried 8.5.1870 Grewelthorpe. Son of William & Sarah Close. Farmer at Bramley Grange. Married Elizabeth Spence. C 1831. WILLIAM BAUL. Bap.3.11.1833 Grewelthorpe. Died 1914 age 81. Son of William & Elizabeth Spence. Married Martha Close. on 26.5.1866. at Kirkby Malzeard church. Lived Grovedale 1871. Farm Bailiff & Widower in 1901. In 1873 Wm Baul was fined for assaulting David Spence of Kirkby Malzeard, a farm servant. He admitted striking him because he would not do as he was told. He admitted the offence to the boy’s Mother Elizabeth Spence. [Ref. Knaresborough Post 1873]. WILLIAM BAUL. Born 1844. Galphay. Son of Miles & Sarah Norris. WILLIAM BAUL. Bap. 25.6.1844 Kirkby Malzeard. Died 1892. Son of James & Ann Porter. WILLIAM BOWEN BAUL. Born 1867. Died 1929. Buried Bishop Thornton. Son of Miles & Mary Bowen. Married Sarah Mary Gregg. Farmed at Clint. WILLIAM JOHN BAUL. Born 8.12.1859 Warren Lane. Bap. 14.1.1860 Kirkby Malzeard. Son of John & Mary Jane Thackray. Butcher / Farmer. Married in 1888 in Newburgh Lancs. to Catherine Alice Webster. [1864-1941]. Sister Elizabeth Baul was a witness. In 1907 moved to Addingham, Ilkley where he died 11.6.1913. William John Baul…. John Baul outside his shop. WILLIAM BAUL. Born 20.9.1874. Bap. 2510.1874. Son of William & Martha Close. Started Grewelthorpe school 28.6.1880. In 1911 living in Masham with his Sister Rhoda & Husband. He was a Brewers Waggoner. Unmarried. In 1939 Married to Jane A. [Born 1881]. Gen Lab. Living Masham. WILLIAM BAUL. Born C.1888 Galphay. Son of Joseph & Elizabeth Hammond. Living Azerley at Gate Bridge Farm in 1901. WILLIAM BAUL. Born 21 Jan 1888. Married to Minnie [born 1888]. Farmer at Woodhouse Farm Grantley. in 1939. WILLIE BAUL. Born 25.5.1901 Galphay. Died 20.6.1938 in Melbourne Australia. Son of Joseph & Sarah Jane Warrener. of Winksley Banks, Galphay. Family of John Baul & Mary Jane Thackray. 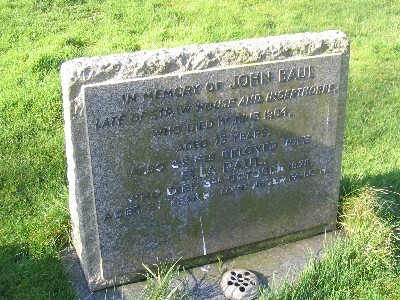 Grave of John & Ella Baul. in Grewelthorpe Churchyard. The children of Harold & Minnie Baul in Australia. Bob, Margaret ,Roy, Gladys. at Roy’s 8oth birthday. 30.10.2010. Thanks to Wendy Dawe for this photo. Hello Grewelthorpe and all fellow Bauls. I’m Luke Baul from Sydney Australia born 1960. Dads brother George Edward Baul born 1893 was in the Australian army, I have Georges service medals, the Galipoli Star is one. After the war both lived in Australia. George in Victoria and James in Hornsby, north of Sydney NSW. Our Grandad James was an Steam Engine Driver at Hornsby. I think I’m the only male Baul left swinging on the Sydney family tree. We are pretty scarce around here. I have 2 sisters Meredie born 1957 and Louise 1958. We are all happy enough in our own funny way. I’d be interested to hear from anyone from this side of the Baul clan. Was your father born on 25th May 1901 and died 20th June 1938? I would like to make contact. I am the daughter of Willie and Alice Baul. The above picture of Harold and Minnie Baul’s children would be my relatives. I would be very interested to see if their are any relatives who would like to make contact with me. William and Martha Baul were the grandparents of my grandmother lucy cartman her mother was jane annie who married john cartman, jane annie died in 1900 2 months after the birth of my grandmother lucy. I can find lucy in 1911 living with a family called ashby as their niece the farm was called dallows. Do you know what happened to my grandmother lucy after her mother died she was not mentioned anywhere in the 1901 census. I am coming to Kirkby Malzeard I September to see where my family came from and would love to have a little more information if possible.